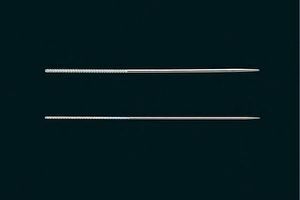 Clover's Snag Repair Needles are the perfect way to repair fabric snags. Each needle has a slightly rounded point to make quick work on both woven or knit fabrics. The textured ends of the needles easily grip loose threads and pull them through to the hidden side of the fabric. Snag Repair Needles work on cottons, linens, silks, synthetic fibers and blends. Individual packages contain two steel repair needles. Clover CL4090 Wonder Fuse Paper Backed Fusible Web Fabric, 9inx8in Sheets, 10pcs per Package.